14k White Gold Boys & Girls Fancy Cross Children's Necklace 15". Ideal for Christening and Communion. Height 11/16" x Width 7/16"
Gift Boxed with Matching Tote. Ready for Gift Giving! If you have any questions about this product by Kids Gold Jewelry Source, contact us by completing and submitting the form below. If you are looking for a specif part number, please include it with your message. 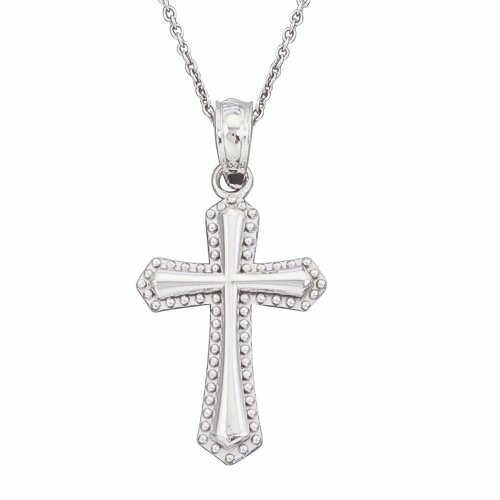 14k White Gold Medium Cross Children's Necklace 15"
14k Gold Small Fancy Cross Children's Necklace 15"